This is the second article in a four-part series on athletic development, from Clemson strength and conditioning coach and #VoltFamily member, Kaitlyn Cunningham, MS, CSCS, SCCC. To read Part 1, click here. 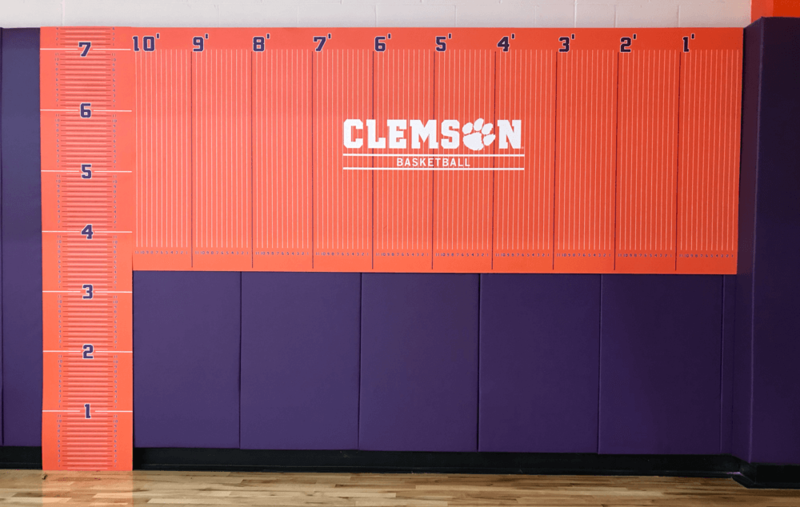 Clemson Basketball’s strength and conditioning staff measures student-athlete height and wingspan, among other performance measures, to determine how to construct the most effective performance training for each individual on the team. Student-athletes are high-performance sports cars, we (strength coaches) are the mechanics, the weight room is our garage, and the practice court is our test track. Just as high-performance sports cars need test runs and consistent evaluation to optimize their performance so do our student-athletes—that is why we have practice, scrimmages and exhibition games prior to the season beginning. The first dimension discussed in my previous post was the mental/cultural component. To have increased success in our second dimension it is important to develop the mental/cultural dimension. The second dimension of athlete development is the performance component. As we like to say in regards to performance training, “Give them everything they need and nothing that they don’t.” It is our job to figure out just what that entails—we do so first and foremost through our performance testing. Just as a high-performance sports car has different makes and models, so do our student-athletes. Their heights, weights, wingspans, and body compositions differentiate those makes and models. While height and wingspan will not likely change at this point in an athlete’s development, weight and body composition could and will. Look at these two entities as the load that the high-performance sport car is carrying. Are these athletes performing efficiently, or pulling a trailer full of bricks—changing their performance? Thinking of the body as an interconnected “chain” of movement can help diagnose compensatory movement patterns and potentially avoid injury. The suspension of a high-performance sport car is comprised of tires, springs, shock absorbers and links to connect it to its wheels. The same goes for student-athletes, with their toes, feet, ankles, and lower quarter of their legs connecting to the rest of their body to allow for movement. As Hudy stated in Power Positions, “ground reaction forces are the foundation for movement” (p. 3). Every movement performed by student-athletes begins from the ground up, which is why we utilize the Functional Movement Screen, Y-balance, and Dynamic Warm-up Movement Assessment to assess movement patterns from the bottom up. While the FMS and Y-balance are performed a few times a year, DWMA is utilized every day as our warm-up for practice—allowing us to consistently monitor movement patterns from the big toe all the way up the body to shoulder/thoracic spine mobility. All three allow us to assess the student-athlete’s mechanical efficiency. The greater the mechanical efficiency, the better they move. The body is a kinetic chain (shown in the graphic, above), and when one part of that chain is not moving or stabilizing properly, other parts of the chain are affected—causing energy leakage and a compensation in movement that can increase the likelihood of injury. During the performance evaluation, student-athletes are asked to perform an overhead squat. One student-athlete had heels rising off the floor and the dowel rod shifting from directly overhead to out in front of their knees and toes, but was able to keep the dowel rod directly overhead when the heels were elevated on plates. Since the heels being elevated indicates that this student-athlete has poor ankle mobility, they were instructed to perform ankle mobility and strengthening exercises. They then performed the overhead squat again without the elevation—with an increased range of motion and strength throughout this new range of motion, the student-athlete feels that this movement is easier to perform and is closer to performing the movement without their heels rising off the floor and the dowel rod staying more overhead than previously. A high performance sports car with good handling will react well to the driver’s inputs and move well along the road. For our student-athletes, this is reflected through the assessments of vertical jump, pro-agility, and 3/4 court sprint. Based on the needs analysis presented by Science for Sport, the activity level of basketball players can be broken down this way: 78.3% of the time is spent standing or working linearly, 20% is lateral movement, and 1.7% is vertical movement. As strength and conditioning coaches, we look to develop all three areas, but based on the information presented it seems as though most of our attention should be put on developing the linear and lateral components of the student-athlete movement. Although most basketball athletes are most concerned with vertical jumping, it may be beneficial to show them these findings and educate them on the importance of the other areas. E.S.D. = Energy System Development. Coach Cunningham uses this flow chart to determine how to dose aerobic work appropriately for individual athletes, based on a fitness test. A high-performance sports car will want an efficient fuel economy—the ability to go further on less fuel. Student-athletes want the same, and must train their cardiovascular system to be more fuel efficient to improve its economy. In order to do so, we must determine their fitness classification and devise an energy system development plan from there. Through the utilization of the Team Pro system, we can monitor training intensities and loads to properly train the aerobic and anaerobic systems. To determine each individual’s fitness classification we perform a fitness test—specifically the 30-15 IFT. Immediately following this test, the data from the heart rate system is analyzed and a 1-minute heart rate recovery is calculated. This heart rate recovery determines the athlete’s fitness classification. Based on that fitness classification, we can then decipher how long that individual athlete needs to train their aerobic energy system in the energy system development flow chart (see above). Through the information gathered from the fitness test via the heart rate monitor system, workouts can be individualized. The system can also evaluate the adaptations and recovery times to specific training sessions. For instance, the athletes are asked to run a 2-mile fitness test in 14 minutes or less. Athlete A and B both finish in 13 minutes and 45 seconds. Without any further information, coaches would assume that both athletes are “in shape.” With the heart rate data, we see something different. Athlete A had an average heart rate of 85% of her max heart rate (MHR) and athlete B had an average heart rate of 95% of her MHR. Which athlete is in better shape? In keeping with the analogy, which one has a better fuel economy? If you answered athlete A—you are correct! Athlete B is mentally tougher, shown by spending on average during her 2-mile run a heart rate of 95%, but we can save the mental toughness conversation for another day. The heart rate technology—as shown through the example above—allows for us as coaches to make sure we appropriate the proper training for our athletes to increase their fuel economy, and in turn, their performance. Clemson Basketball uses the GymAware system to measure bar velocity in certain key movements, to evaluate an athlete’s ability to product force quickly. The horsepower is brought out in a high-performance sport car via its engine. A student-athlete’s horsepower is built through strength and rate of force development (RFD). We realize that basketball athletes do not need brute strength like a football player—instead, they need a blend of strength and speed. Via our performance evaluation we use bar velocity for 3-rep maxes on bench and squat to predict 1-rep maxes (place link to article). Also, to ensure we are eliciting the proper physiological response within our training, we utilize the GymAware system (velocity based training, or VBT) in conjunction with auto-regulatory progressive resistance exercise (APRE). Through prescription of a given velocity, our objective is an upward and rightward shift in the force-velocity curve—improving the student-athlete’s strength and rate of force development (RFD). Improvements can be seen in as soon as a week for a specific movement, in all training times of the year (off-season, pre-season and in-season). We had an athlete in-season perform a back squat with 135 lb at a mean velocity of 0.67 m/s, then performed the same movement the following week with 135 lb at a mean velocity of 0.71 m/s. That’s improvement, proven through a shift of the force-velocity curve to the right. The following week, the same athlete back-squatted 140 lb at a mean velocity of 0.67 m/s, meaning they improved through another shift of the force-velocity curve. This athlete improved strength and RFD, all in-season when practice and skill development are at their peaks. You would not want to keep your high-performance sports car in the garage for months, weeks, or even days leading up to the race. You wouldn’t want to do the same with your athletes, either. There are many different ways to prepare an athlete for their “race.” First and foremost, performance testing helps us understand where that specific student-athlete is at in all aspects of their performance prior to any training. Also, during training, we want consistent evaluation during their time leading up to the “race” to ensure proper preparation. In the future, there will be a follow-up post regarding our new piece of technology, Sparta Science force plate and software, in terms of its use and ability to monitor student-athletes mechanical efficiency. As of this point in time we have not utilized the system for a long enough duration to include its use in this post. The information presented here is an insight into our basketball strength and conditioning program at Clemson that we have found successful in a collegiate setting. If you have any questions or would like to further discuss anything presented above, please feel free to reach out to me via Twitter @k_cunningham32. Hudy, Andrea. Power Positions Championship prescriptions for Ultimate Sports Performance. Kendall Hunt Publishing Company, 2014, p. 3. Join hundreds of thousands of coaches and athletes using Volt's intelligent training system. For more information, click here. Kaitlyn Cunningham, MS, CSCS, SCCC, is the strength and conditioning coach for the Clemson women’s basketball team. A four-year letter winner as a soccer player for the University of Kansas, Kaitlyn went on to earn her master’s in Sports Administration from Eastern Illinois University, where she also spent time as a grad assistant. In addition to her MS, Kaitlyn holds certifications through the NSCA and CSCCa, and has worked with Clemson’s women soccer and rowing programs before moving to basketball.